Whether a muzzle brake, compensator, flash hider, suppressor, or something else entirely, the world of AR-15 muzzle devices is vast and deep. The best one for you may not be the best one for me, so try not to freak out when you see my list of the six best muzzle devices for the modern sporting rifle . . .
Muzzle brake test #4 will happen soon! It’s scheduled for three months ago, so it will be along any time now. 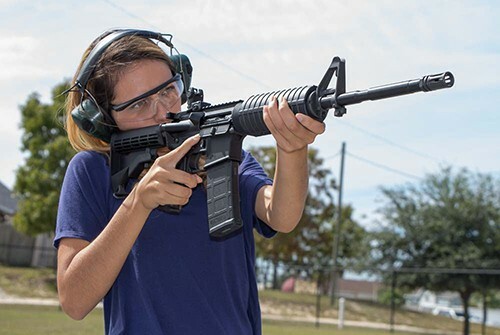 This test will include recoil reduction, dB measurement (sound volume level), and muzzle blast measurement (concussion — the overpressure wave through the air that thumps your chest and sinuses). With no hesitation or doubt in my mind whatsoever, I can unequivocally state that the best muzzle device you can put on a rifle (AR-15 or otherwise) is a sound suppressor. AKA a silencer. They may not have the recoil reduction of a muzzle brake, but cutting felt recoil by about 50% is nothing to sneeze at. Speaking of sneezing, a suppressor reduces muzzle blast to about that level. For the shooter, muzzle blast and concussion are reduced almost entirely. This alone makes the experience of shooting a rifle vastly more enjoyable. Obviously those gunshots won’t be as loud with a firearm muffler attached. In most cases a suppressor is designed to reduce volume levels by at least enough that decibels enter the “hearing safe” zone. In contrast, many muzzle brakes, compensators, and flash hiders actually increase sound levels at the shooter’s ear (brakes are typically extremely loud!). With a suppressor, you’ve effectively moved your ear protection from your head to the muzzle of your rifle. Much more convenient. Safer, too. Finally, most sound suppressors are also excellent at flash suppression. While not typically marketed as a flash suppressor, that silencer will reduce muzzle flash by as much as most dedicated flash hiders and light years more than a muzzle brake, typical compensator, and certainly a bare muzzle. While the cost of entry is high and there’s paperwork and a wait period involved (Silencer Shop makes the process the easiest in the country, FYI), a suppressor is the best AR-15 muzzle device you can possibly choose. Now, if I had to choose a silencer to single out as the best rifle silencer currently available? . . . ooph, that’s a hard one. But I’ll do it: the Dead Air Nomad-30. With a fully modular mounting system, a large diameter and short length, 17-4 PH stainless steel construction, swappable end caps, the ability to be used on anything firing a .30 caliber (7.62) or smaller projectile, and a modern, tubeless design with the sharpest little laser welds I’ve ever seen — and, yes, it’s super quiet — the Nomad is my number #1 rifle suppressor suggestion right now. I have no idea how the Cherry Bomb performs on its own (we’ll find out in test #4)! But it’s the best muzzle device for attaching a suppressor to a rifle. That’s right, we’re still on the suppressor thing because it’s so far in the lead as the best AR-15 muzzle device choice that it owns both the #1 and #2 slots in my little listicle here. Q’s Cherry Bomb is what I’d have to call a semi-quick detach option. It isn’t as fast as many of the quick-and-dirty, spring-loaded, ratchet- or click-on systems that often require only a quarter or half turn of the suppressor, but it’s way faster than a direct thread suppressor. Instead of 20-ish rotations to tighten, with the Cherry Bomb it only takes five spins to go from removed to completely tight. Just hand snug — and relatively gently, at that — will do it. Thanks to the large taper mount section, a suppressor on a Cherry Bomb is far less likely to loosen on its own than one up against a square shoulder. Inside the Cherry Bomb is another taper mount area for use on a tapered barrel, but it’s also compatible with a standard, square-shouldered barrel. You definitely want the suppressor coming off the brake rather than the brake coming off the barrel, so tighten that sucker down via the 1/2″ socket drive shape on the Cherry Bomb’s muzzle end. No crush washer needed, as the Cherry Bomb doesn’t have to be timed. Thanks to the taper’s location in front of the threads, those threads will always be as clean as new. This, not threads in front of taper, is the way to do it right. Just look how clean the taper and threads are in the photo above, despite all that carbon baked onto the compensator area! Obviously the Cherry Bomb works directly with Q’s own Trash Panda and Thunder Chicken suppressors, and now with the Plan-B by Q it’ll also work in the aforementioned Dead Air Nomad-30, a bunch of SilencerCo cans, and some others. Inside a suppressor, the Cherry Bomb acts as a sacrificial blast baffle, bearing the brunt of the high pressure, high heat, and abrasive particle-filled gas exploding out the barrel. It’s nicer to wear down a $75 part than the blast baffle of your $800 silencer. Cherry Bombs are available for .223/5.56 with 1/2×28 threads as well as for .30/7.62/6.5 applications with 5/8×24 threads. Basically, you can install them on most of your AR-15s, AR-10s, and bolt actions and quickly move the same suppressor between them all. So you live in some lame place where silencers aren’t legal? Okay, I’ll continue this “best of” list just for you. Everyone else, save up and buy a dang suppressor. My favorite all-around AR-15 muzzle device is the Precision Armament AFAB-556 Hybrid Muzzle Brake. To be clear, it isn’t really the best at anything. It doesn’t win at reducing felt recoil, taming muzzle rise, providing muzzle flash suppression, or eliminating muzzle blast. But it’s better than average in every category and it’s my go-to choice. Which means it’s the best. The AFAB-556 cuts recoil in half. It does this with a minimum of blast and concussion (more than a linear compensator, less than most other options), and it isn’t as loud as other brakes and comps. It’s very nearly as good a flash hider as an A2 birdcage, but keeps the muzzle far more stable. The AFAB-556 is fairly compact and light weight, and darn if I don’t love how it looks on a semi-auto rifle. As with everything from Precision Armament, the machining and finish quality is as good as it gets. To be fair, Precision Armament’s EFAB is slightly better in nearly every way. But it’s substantially more expensive and I prefer the looks of the AFAB. In AR-15 Muzzle Brake Shootout #3, the SJC Titan edged out the reigning champion, the Precision Armament M4-72. Though it’s currently the best AR-15 muzzle brake I’ve tested by eliminating 78% of rearwards recoil, I’m also 100% confident it will not win shootout #4. There are others, like the ZRODelta Cowl Induction Brake Gen2, that I expect will be right in the mix with the past winners and perhaps even edge them out. But my guess is the Apollo Max or Hypertap will be the new king of the hill. We’ll see! From the shooter’s perspective there’s nothing to damage your low light night vision. No flash or brightness visible whatsoever. From the side, if you can see into one of the slots, you may catch the tiniest kernel of flame inside the base of the 249F. From 50 yards directly down range, it’s blackness. Various military units — domestic, NATO (NSN: 1005-01-526-3464), and otherwise — run the B.E. Meyers 249F and variants designed for other calibers. It works. It’s the best AR-15 flash hider on the market. And, best of all, you don’t even have to enlist to get one. Imagine an AR-15 is floating in mid-air (whether hung by two strings or by magic) parallel to the ground. The center of the receiver extension (buffer tube) is backed up against a trailer ball affixed to a gazillion-pound truck. There’s nothing at all on the muzzle. The gun fires. It does not move. There is no force sending the barrel upwards. The only force is rearwards (maybe the smallest bit of sideways force as the empty case is ejected out to the right). Unlike a rifle where the recoil pad is lower than the bore, the rearwards force does not generate any leverage that causes the muzzle to climb. So what is it, then, that causes muzzle rise, even with an AR? It’s you. Muzzle rise in the AR platform is the shooter’s fault. It’s from allowing the rearwards push to push you around. You’re tipping backwards from your ankles on up to your shoulders — often mostly at the waist — and the effect is your torso leans back. The gun follows and the muzzle climbs as your shoulders recline. Many shooters also position the stock of an AR-15 high on their shoulders with the centerline of the receiver extension way up there. Sometimes literally above their body. This will cause the rifle to roll up the shooter’s shoulder. Not due to muzzle rise, but due to rearwards recoil. So how much muzzle rise compensation do you need? How much do I need? How much does a competitive shooter or an Operator operating operationally need? Heck, how much do I need when I haven’t been shooting for a while and how much do I need when I’ve spent all week shooting an AR-15? There is NO correct answer to this. Other than to provide a neutral muzzle device that can then be tuned by the end user to add incremental amounts of downwards force and to eliminate the actual cause of “muzzle rise,” rearwards recoil. Ultimately, the better one’s shooting position and fundamentals are and the less rearwards recoil they have to fight, the less muzzle compensation they’ll need and even a small amount will be annoying as they’ll be fighting that downwards force on every shot. A neutral AR-15 is a good AR-15, but the ability to add a little compensation to suit one’s shooting style is always nice. BUT . . . I’m told I have to pick a winner. So, what’s the best AR-15 muzzle device for combating muzzle rise? Why, that would be the Juggernaut Tactical Juggerbrake. The hands-down muzzle rise killing champion of the world received a rock solid and well-deserved, zero-star rating from me in its review. It slams the muzzle down so freaking hard that the barrel visibly bends. Unless you want follow-up shots in the dirt by your toes, I’d look elsewhere. But it’s still the anti-muzzle rise winner.